Send an e-mail link to view assets from Elvis. Send an e-mail link to upload assets directly into Elvis. Access Elvis using the Server 6 client when on the road or when working from a remote site. Integrate other web applications using the Elvis API. In these cases you may need access to the Elvis server through the internet. Elvis uses only standard HTTP (port 80) or HTTPS communication, making it very simple to provide safe access to the Elvis server from remote locations. To fix this, the internal Pro clients need to connect to the Elvis server in the same way you would access it from remote locations. This can be accomplished by using a domain name linked to the external IP address of the Elvis server. 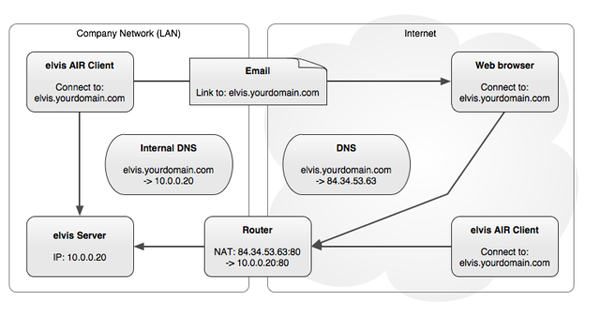 The DNS server on your local company network can redirect any local clients to the internal IP address of the Elvis server. Another option is to configure an explicit external server URL for email links composed in the AIR client. When the Elvis server has a different external and internal address or domain, this setting will force the server URL used in email links, even when the initiating AIR client is connected to an internal address. In most cases it is preferred to use proper DNS setup so the internal and external domain of the Elvis server are the same.